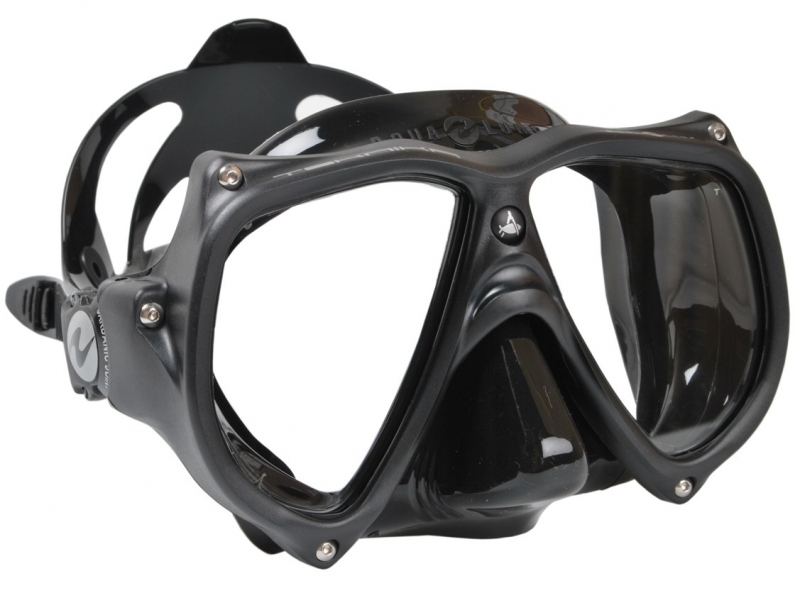 For centuries human beings have been fascinated with the concept of being able to “breathe” underwater while exploring the deep blue sea. 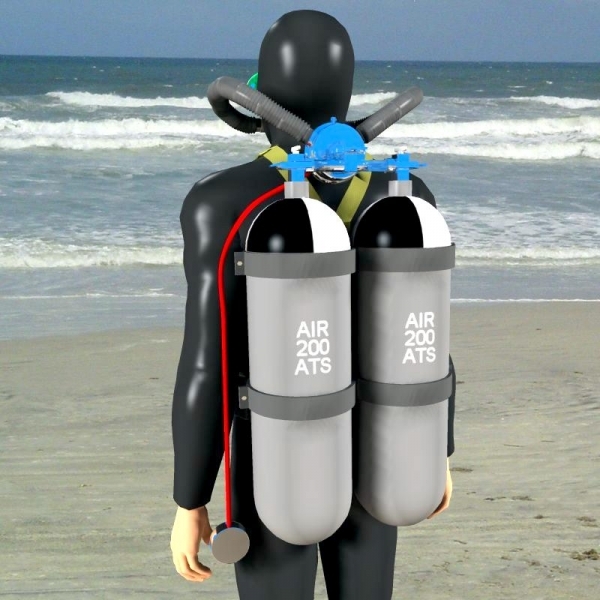 As early as the third century, Aristotle is said to have made references to some type of breathing apparatus that would allow a person to stay underwater for an extended period of time. 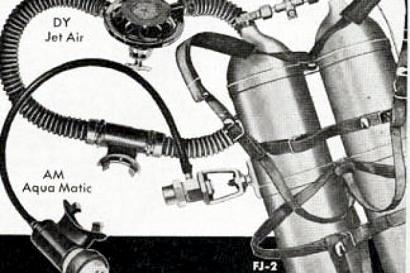 After years of somewhat crude inventions ranging from goggles to snorkels to 16th century “diving bells” technology began to advance and inventors devised equipment such as the air pump, created in 1771 by John Smeaton; a breathing belt, invented in 1825 by William James; underwater breathing systems created in 1828 by John Deane and Charles Deane and in 1837 by Augustus Siebe; a self-contained underwater breathing unit created by Henry Fleuss in 1873; and a breathing system for the U.S. military designed by Christian Lambertson in 1939. 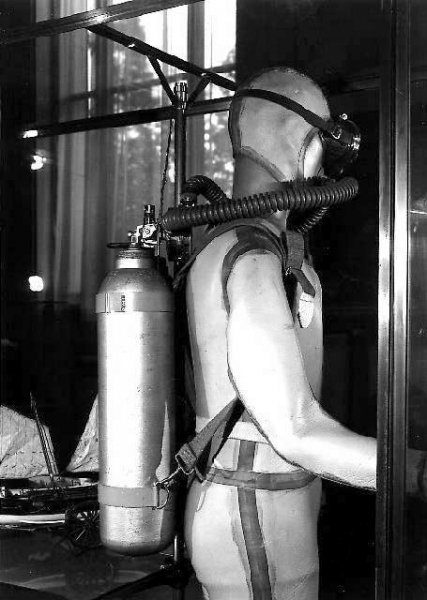 Lambertson’s system, designed for the military’s SCUBA program (“Self-Contained Underwater Breathing Apparatus”) was somewhat successful, but divers were injured or killed frequently from oxygen toxicity. 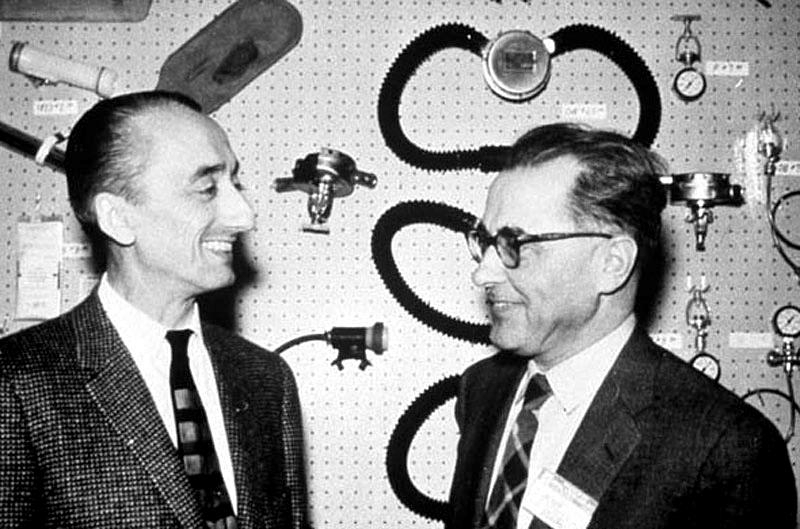 Shortly thereafter in 1943, Jacques-Yves Cousteau and Émile Gagnan invented a system that would revolutionize the world of deep-sea exploration and push diving into the mainstream, allowing people around the world to become exposed to a magical oceanic wilderness they had been unable to experience before. 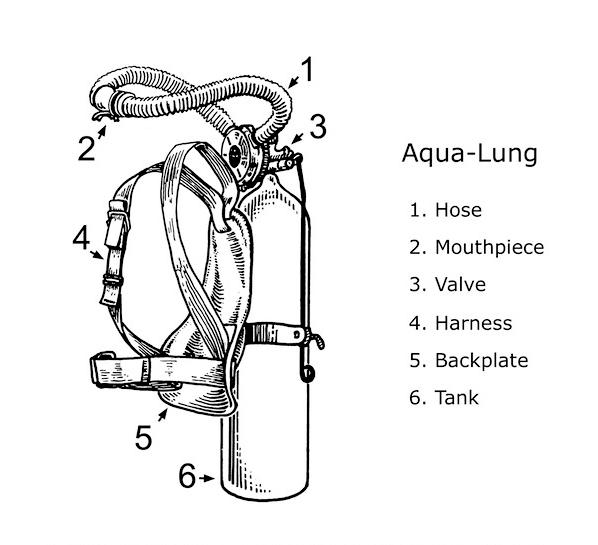 The system they developed is known as the “Aqualung”, which was registered under the Aqualung Diving Equipment Patent #2,485,039. 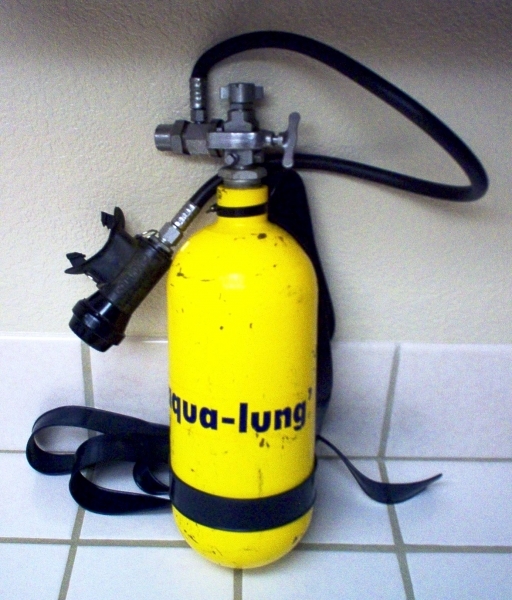 Cousteau modified the regulator, adapted it and made it the crowning piece of his Self-Contained Underwater Breathing Apparatus (SCUBA), the Aqua-Lung. 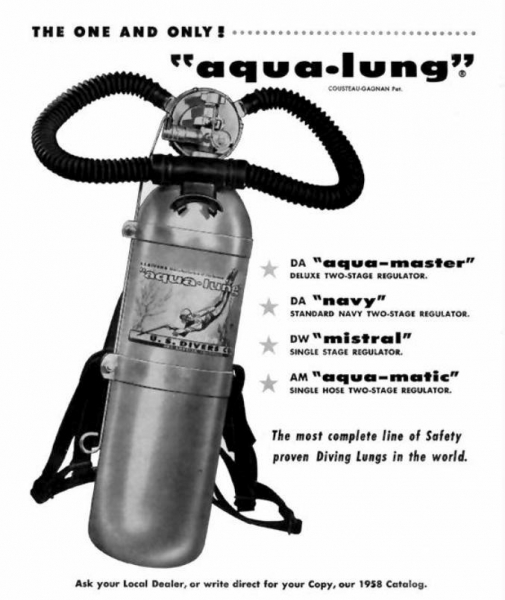 The story of the Aqua-Lung goes back to World War II. 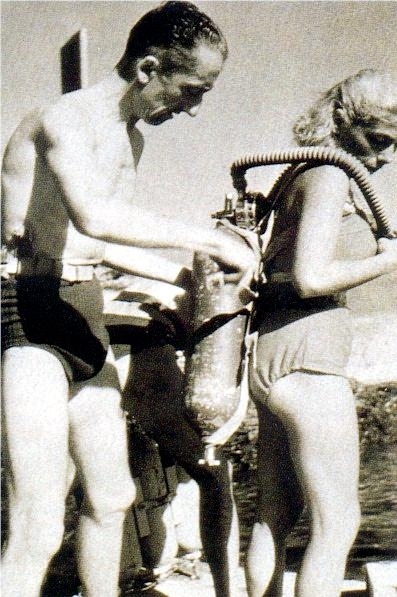 In June 1943 on a small beach of the Riviera, Jacques-Yves Cousteau wearing rubber fins, shouldered the new completely autonomous diving gear. 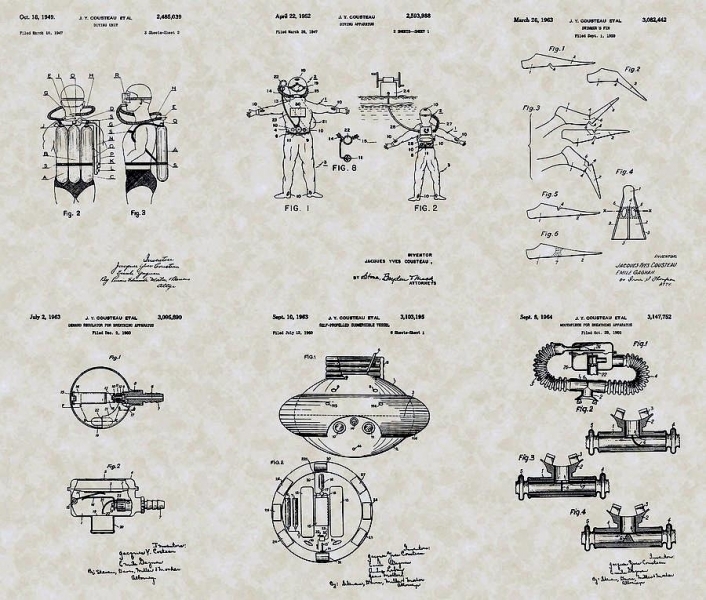 It was inspired by the discoveries that preceded it particularly that of Captain Yves Le Prieur, pioneer of autonomous diving who in 1925, perfected an open-circuit, compressed-air device. 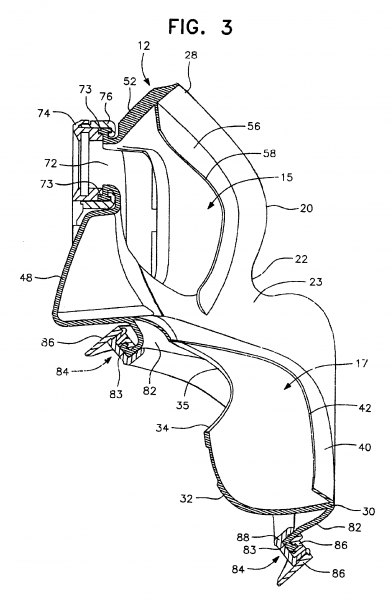 There was one problem: the continuous flow of air limited how long the device could be used. During the war, the solution was born in Paris as the Germans requisitioned automobile gas. 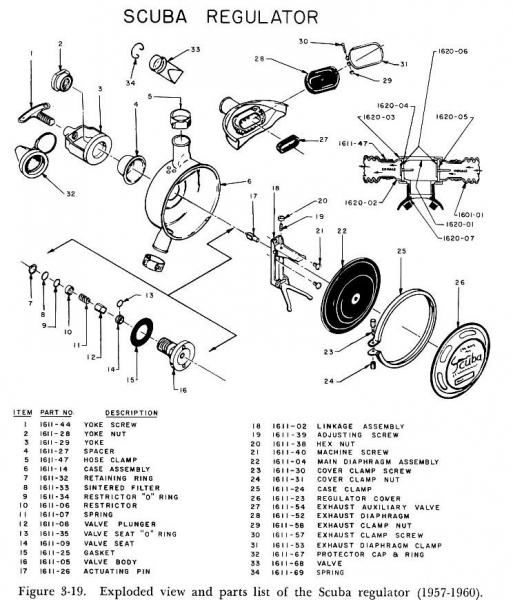 Engineer Émile Gagnan invented a demand regulator that would feed cooking gas to a car’s carburetor in the exact amount the jet needed. 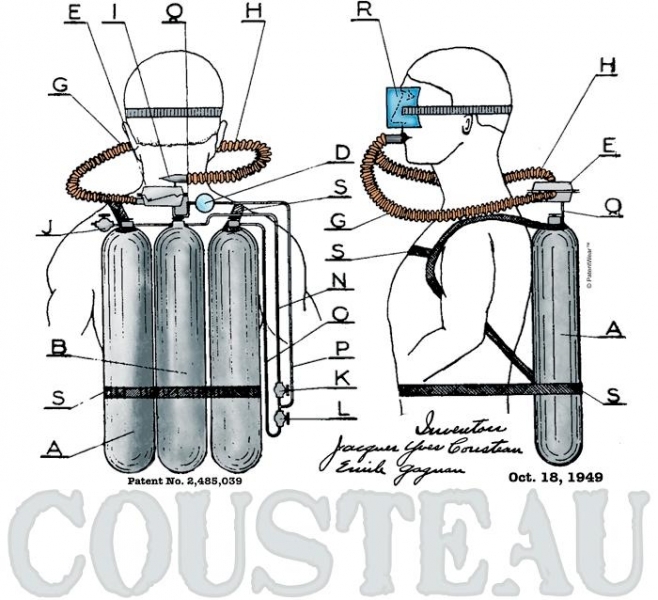 Cousteau modified the regulator, adapted it and made it the crowning piece of his Self-Contained Underwater Breathing Apparatus (SCUBA), the Aqua-Lung. 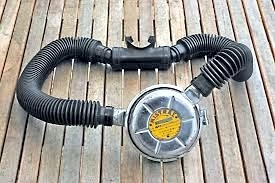 In 1966, Cousteau brought together his best divers, engineers & designers to provide Calypso with sophisticated equipment they called “streamlined scuba”. This new equipment reduced fatigue and consequently air consumption, allowing the divers to move about more quickly and for a longer time. 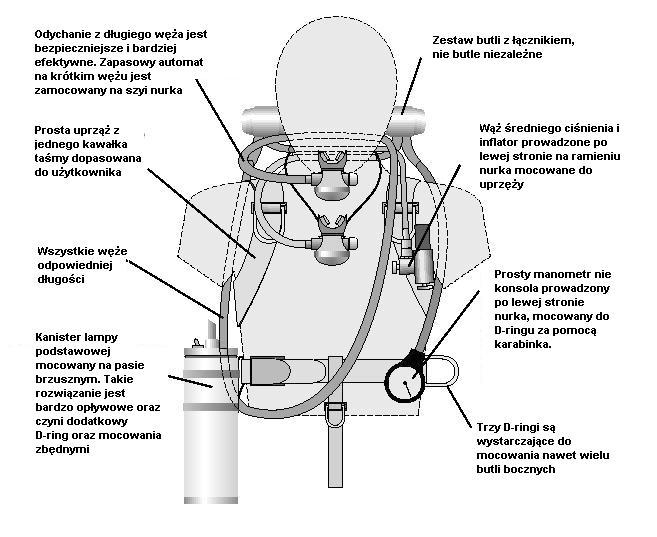 The membrane of the regulator was positioned on the chest, closest to the center of the volume of air in the lungs. 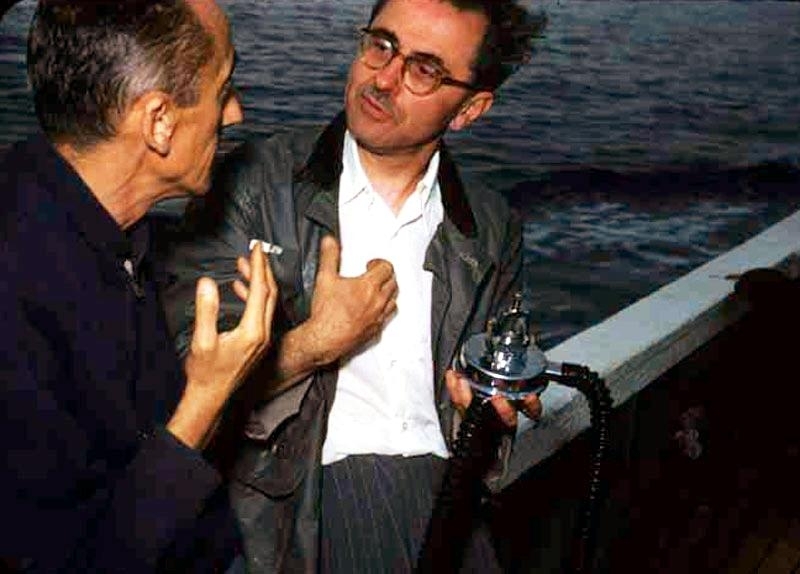 Cousteau was born June 11, 1910 in Saint-Andre-de-Cubzac, France near Bordeaux. He was well-traveled thanks to his lawyer-father, who moved often and took his family with him on frequent trips. Cousteau was a restless student but an avid swimmer with an interest in film and natural technical ability. In 1930, he was admitted to France’s Naval Academy. He served in the navy and later entered naval aviation school but after a car accident at age 26, he was transferred to sea duty and began a rigorous swimming program to regain strength in his arms. During World War II, he served as a spy for the French Resistance and was decorated with the Legion of Honor at the war’s conclusion. Meanwhile, he pursued an interest in sea exploration and managed to make several underwater films during wartime. 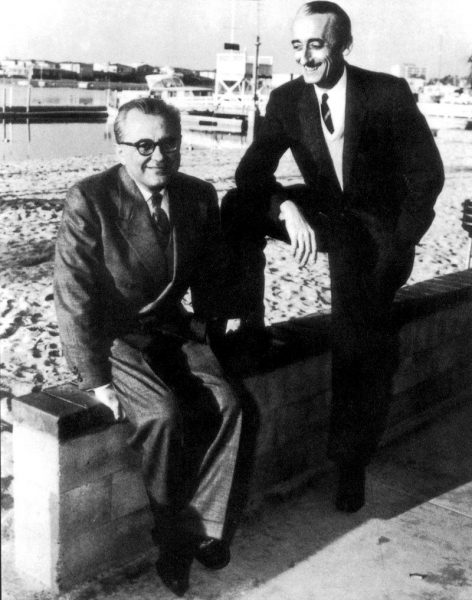 He also met fellow Frenchman and engineer Émile Gagnan, with whom he collaborated on creating a machine that he hoped would turn him into somewhat of a “man-fish” under the sea. Oxygen and air-pressure regulation he knew would be key. 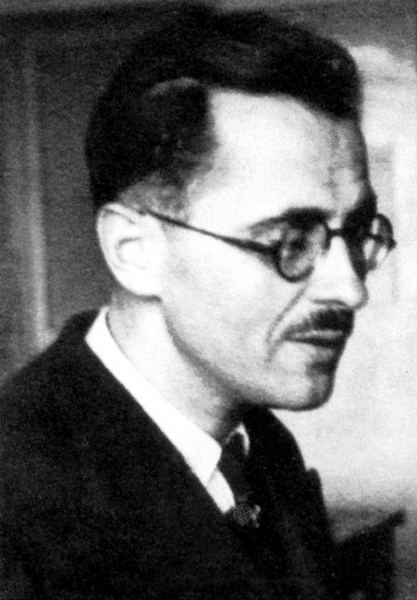 Émile Gagnan was born in Burgundy, France in 1900. 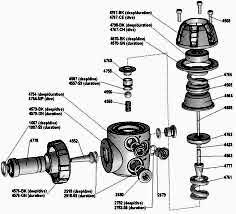 He earned a technical degree and began working as an engineer for L’aire Liquide, with specialization in high-pressure pneumatic design. 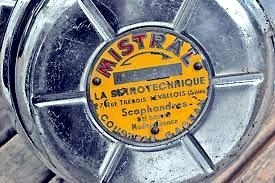 With Cousteau he began working to create a demand-valve for what was to become the Aqualung system. 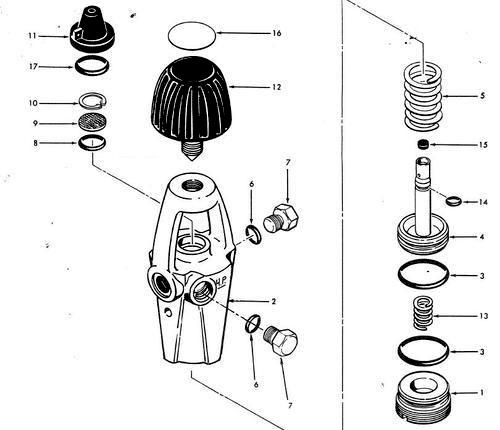 A similar type of valve had been used in gas-generator engines and Gagnan imagined it would also be useful in regulating air supply in a variable pressure environment. 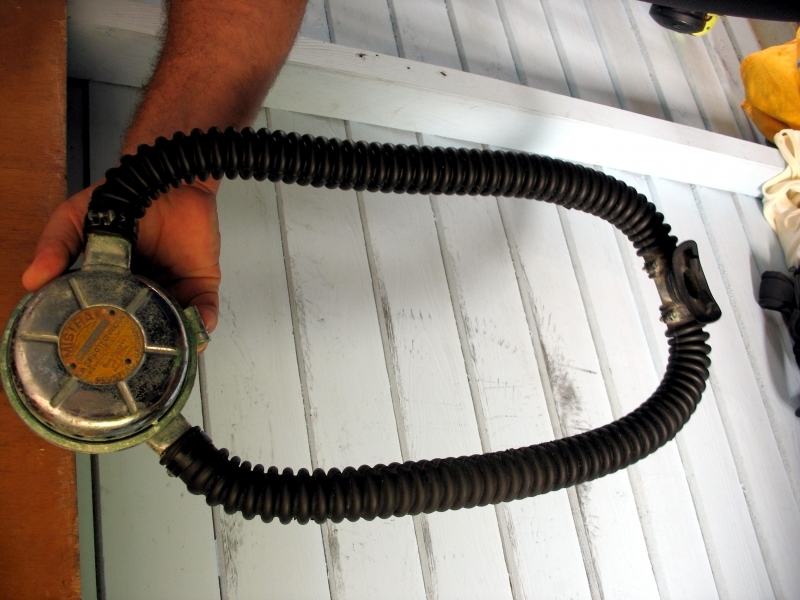 His theory was correct and this valve would be a central component of the Aqualung’s demand regulator, which adjusts air pressure automatically and supplies air as a diver needs it, so that air pressure inside a diver’s lungs match the pressure of the water. This would prove a critical and groundbreaking safety feature. 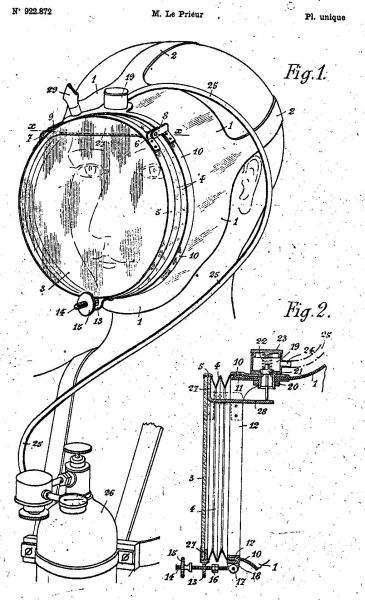 After a few unsuccessful attempts, Cousteau and Gagnan perfected a device that was incredibly safe, reliable and easy to use. This would change the diving scene forever. The Aqualung was first sold in France in 1946. 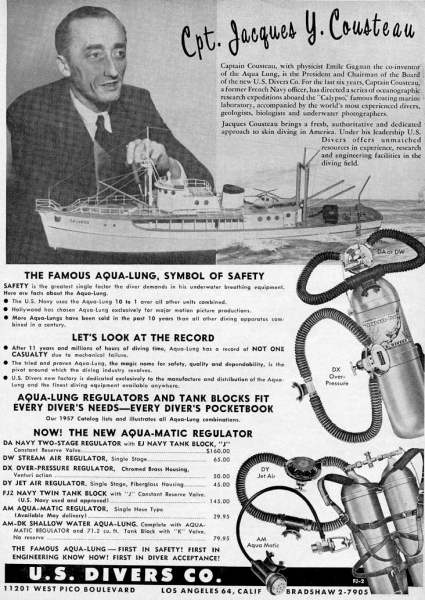 By 1951, Aqualung systems were being sold in England and in Canada. U.S. distribution rights were acquired in 1952 and U.S. Divers launched to great success. Air Liquide a French company, bought U.S. 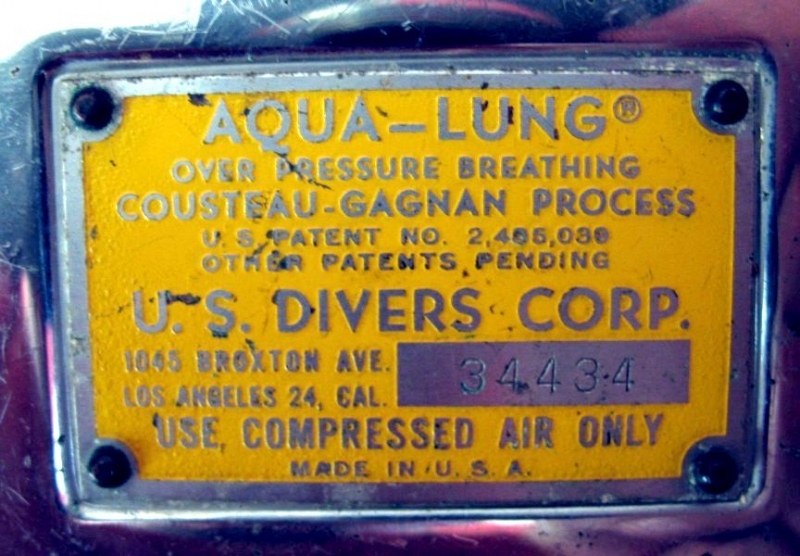 Divers in 1958 and changed the name to Aqua Lung America which became part of Aqua Lung International, established by Air Liquide in 1988 and now the world’s largest diving company. 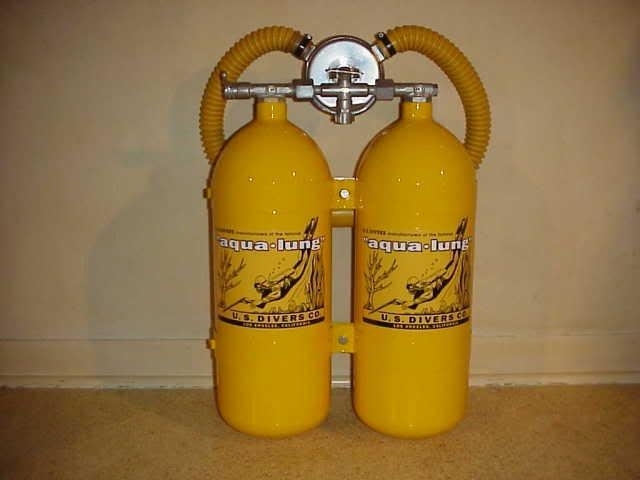 The Aqua-lung system is now part of virtually every set of modern SCUBA gear in the world, with thousands upon thousands of units sold and recreational scuba diving has become an international phenomenon. 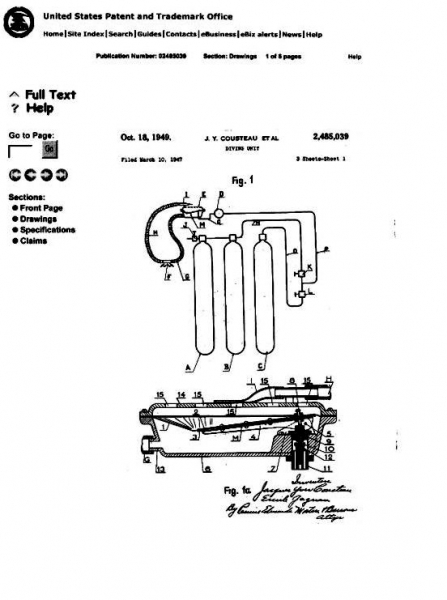 In 1947, Gagnan emigrated with his family to Montreal, Canada where he began working for Canadian Liquid Air Ltd. 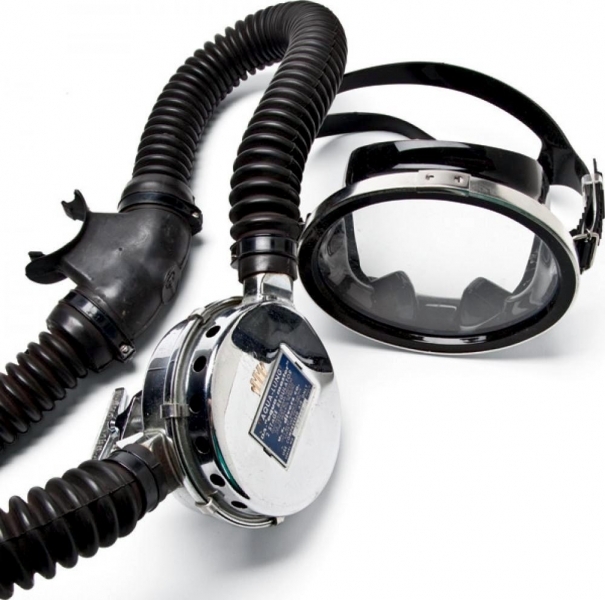 There he set up a lab to designed & developed a large number of technologies integral to the evolution of modern SCUBA equipment and proceeded to engineer, design, prototype and patent an incredible number of SCUBA & undersea technology firsts including the direct ancestors of virtually every type of Scuba regulator in common use today. Émile Gagnan died in 1979 of a heart attack. 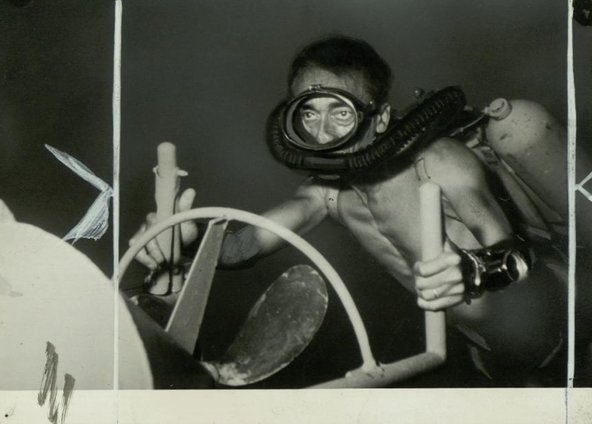 Meanwhile Cousteau who had already become known in his field, developed an international reputation as a pioneer of deep-sea exploration as well as an environmental activist. 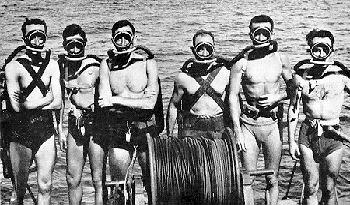 In 1952, he published “Silent World” with Frédéric Dumas and James Dugan which attracted many to the world of recreational diving. He later wrote many more books including “The Living Sea” in 1963 and “World Without Sun” in 1965. His acclaimed documentary television series “The Undersea World of Jacques Cousteau” began in 1968 and ran until 1976. He was nominated for 40 Emmys with his documentaries and won three Oscars for them as well, for “The Silent World”, “The Golden Fish” and “World Without Sun”. In 1950, he became president of the French Oceanographic Campaigns and began sailing his ship “Calypso” on regular explorations. 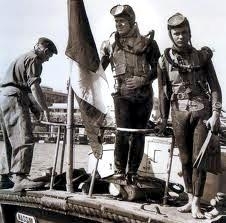 Soon he retired from the navy, but not until after he had helped create post-war mine-sweeping techniques for use in shipwrecks as well as in French harbors. 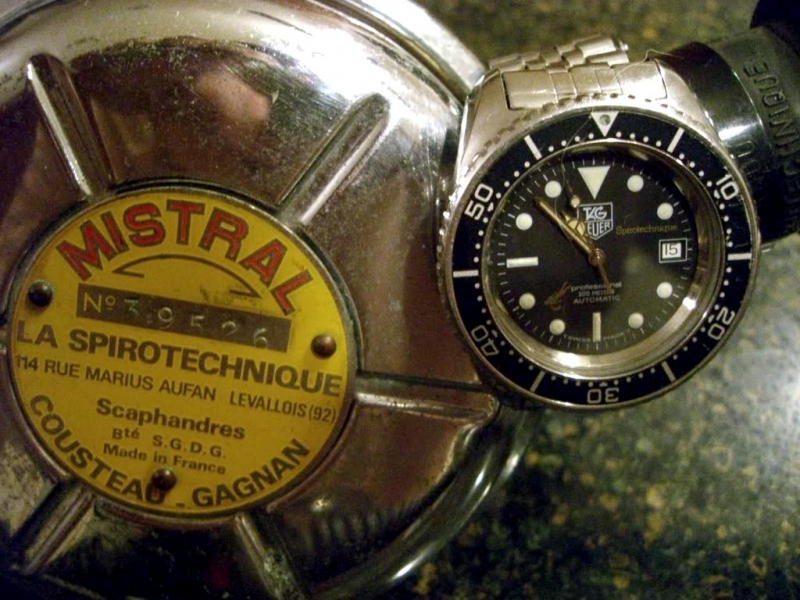 In 1963, he developed the “Calypso-Phot” underwater camera and with Jean Mollard, the SP-350 deep-sea, two-man submarine. 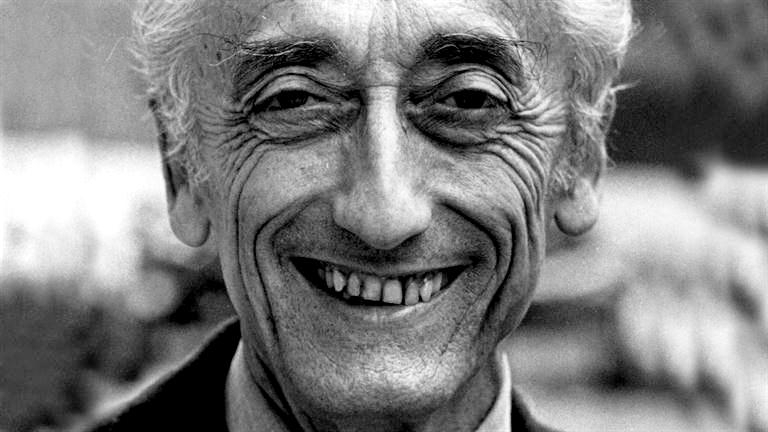 In 1974, Cousteau started the “Cousteau Society” for the protection of ocean life. He was awarded the Medal of Freedom by President Reagan in 1985 and in 1987, he and Peter Scott received the United Nation’s International Environment prize. In 1992, he became a regular consultant for the United Nations and the World Bank on habitat development and global environment. 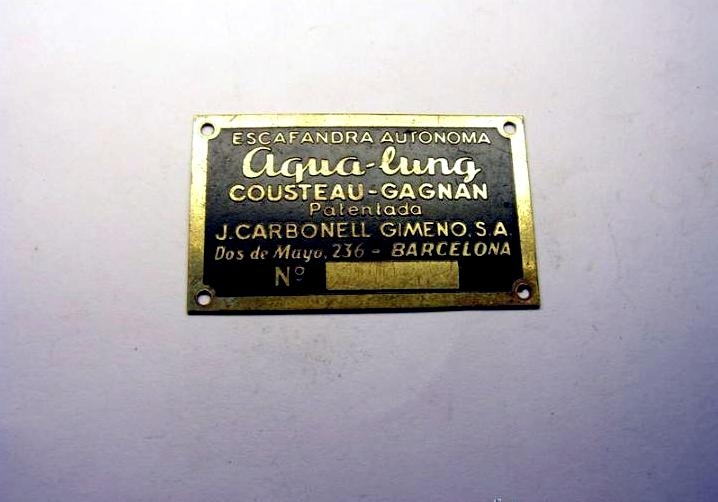 Cousteau also served as chairman of the U.S. division of the Aqua-lung company’s board of directors, working well into his 80’s. Jacques-Yves Cousteau past away on June 25, 1997 at the age of 87.